The Red Sox' starting catcher was injured in this July 1995 contest and in stepped backup Bill Haselman. Only the situation was more difficult than most, Haselman noted later to The Hartford Courant. Tim Wakefield was on the mound, throwing his often-unpredictable knuckleball. "It was tough," Haselman told The Courant later. "I can't think of a tougher situation to come into, with a runner on third in the middle of an inning and catching a knuckleball." Haselman did well enough in that outing, he even hit a grand slam to help give the battery some breathing room. He also went on to play 64 games for Boston on the season, the most time he'd seen in his five seasons with time in the majors. Haselman went on to play in a total of 13 major league seasons, serving mainly as the backup catcher. Since, he has gone into a career in coaching in the majors and managing in the minors. 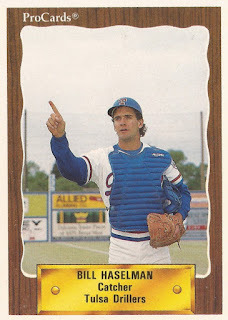 Haselman's career began in 1987, taken by the Rangers in the first round of the draft out of UCLA. He played that first year at single-A Gasonia, hitting .306 with eight home runs. He made AA Tulsa in 1989, hitting .270 there. He returned to Tulsa for 1990, hitting .319 and getting his first call to the majors in September. With the Rangers in 1990, Haselman got into eight games, getting two hits in 13 at bats. He spent the next year back at AAA Oklahoma City. He was also then taken off waivers by the Mariners for 1992. He made Seattle for eight games in 1992, then 58 in 1993. It was in 1993 that Haselman helped touch off a large brawl, after getting hit by a Mike Mussina pitch. It was later called "one of the biggest brawls in baseball history," with several players ending up injured. "You don't expect fights to last that long. You just expect the one pileup, then that's it," Haselman told The New York Times afterward. Haselmen had homered earlier, then charged the mound later after getting hit by a pitch. "After the first pile, I thought it was done. Then I looked over and another fight broke out, and then another one." Haselman returned to the Mariners for 1994, getting into 38 games. For 1995, though, he signed with the Red Sox, getting his most time thus far, 64 games. In one late June game, Haselman proved the difference. Again, he came in as a late-game replacement. In the 11th inning, he hit a walk-off home run, The Courant wrote. "It's nice, because you always want to feel like you're doing something,'' Haselman told The Courant later, in August. "You don't want to just come in there and catch a game and not do anything. I try to go out there and maybe fool myself, like I'm mentally right on top of it. When you haven't played much, you need to stay sharp some way." Haselman stayed with the Red Sox through 1997, his final year getting the chance to start, but he had throwing problems. He then played with the Rangers and Tigers through 2002. Starting was something Haselman wanted to do, but serving as a backup was something he had come to accept, he told the Sarasota Herald-Tribune in spring 2002. "Coming up, you strive to be the starter," Haselman told The Herald-Tribune. "For me, it didn't work out that way too much. I've learned to accept the position and do what I can do with it. I just try to do the best job I can when given the opportunity." Haselman played his last major league game in 2003, back with the Red Sox. He has since gone on to be a coach with Boston. In 2010, Haselman served as manager of the Rangers' single-A Bakersfield Blaze. "We're going to play with a lot of energy," Haselman told The Bakersfield Californian in April 2010. "We're going to try and go out there and do things we're supposed to do and play the game fundamentally sound. Hopefully, that translates into good results."